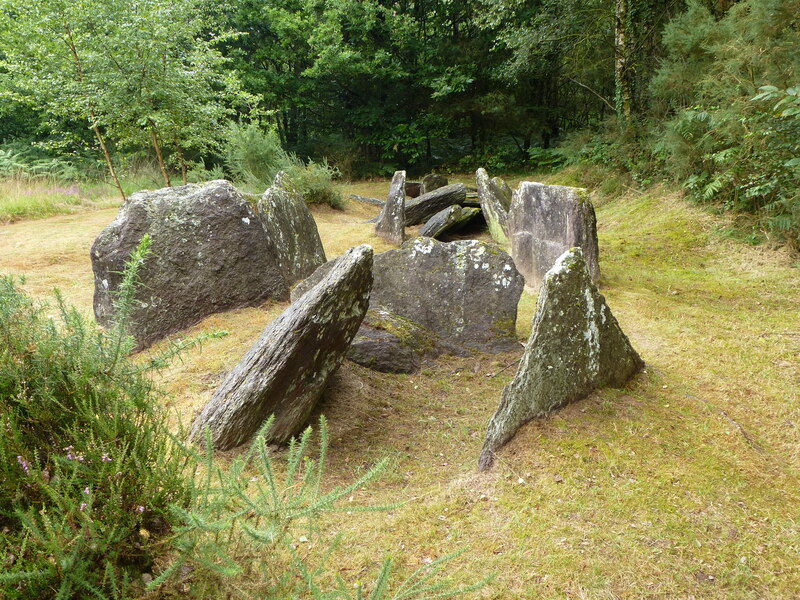 Readers of this blog will know that I am a regular visitor to Brittany, and that I enjoy nothing more than scouting out its many ancient sites – menhirs, dolmens, burial mounds, the place is littered with magical reminders of our ancient history. One of the best-known sites in the region is at Montneuf, where a recently restored set of standing stones attracts crowds of enthusiastic tourists every year. With its busy visitors’ centre, helpful information boards and regular educational events, this is a marvelous place, and is definitely well worth a visit…but magical it is not. On my recent visit to Montneuf, however, I picked up a leaflet with a map of the surrounding area, and noticed that it featured a number of interesting-looking sites in the forests and moors that spread out around the stones. The weather was changeable, and I wasn’t wearing sensible walking shoes, but fired up with the notion of discovering some magic, I set off anyway, the map in my hand and a spring in my step. The first location on my list was a site known as La Loge Morinais. The path led me into the forest, and drizzle began to descend from the darkening sky. On I walked, turning here and there as the map dictated. Soon I realised that I must have walked too far, and turned back to try another path. On it lead, but still no sign of the Loge. I could feel my socks getting damp, and the rustle of the rain on the canopy of leaves above my head was becoming more insisted. It was clear that I was lost. I turned back again, took a long hard look at the map and then another at the forest around me. There was only one path left, so I took it, feeling rather pessimistic that I would ever reach my goal. And then suddenly there it was – a wooden sign pointing down a narrow path towards a clearing in the trees. At last I was there. I had found La Loge Morinais. 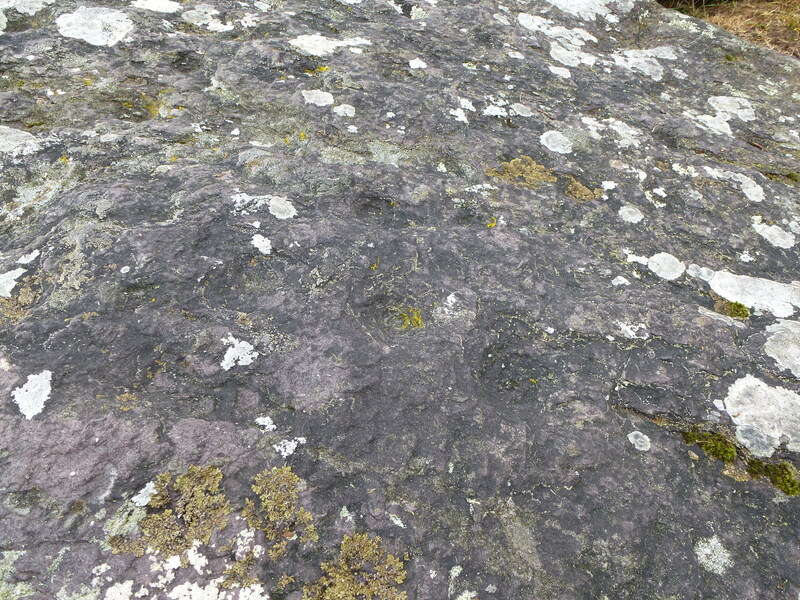 Once a huge covered passage grave, La Loge Morinais is constructed from immense slabs of local purple schist. Its cap stones may have fallen long ago, but at thirteen metres long it is still an impressive ancient monument, well worth the long treck and those damp socks. 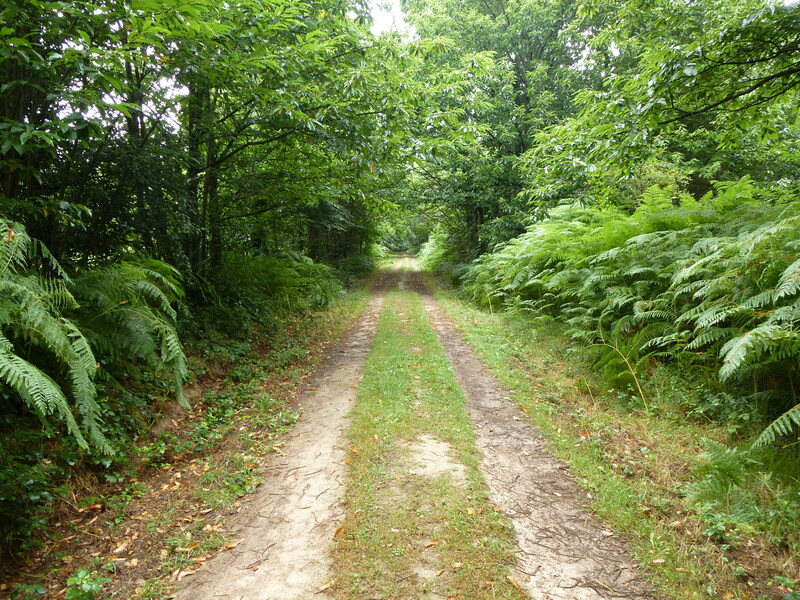 Next my walk took me out of the forest and on to the moors of Montneuf. Luckily the sky had begun to clear, and I could take the time to enjoy the incredible views across the wild lanscape as I continued my search. I was all alone, with noone to be seen for miles around, so I was able to enjoy of the rare peace and tranquility of this unique place. My next target, La Roche Blanche, or White Rock, was much easier to find, and its distinctive name gives a fairly good idea of what to look out for. There is more to this monument than just the large block of white quartz that gives it its name, however. 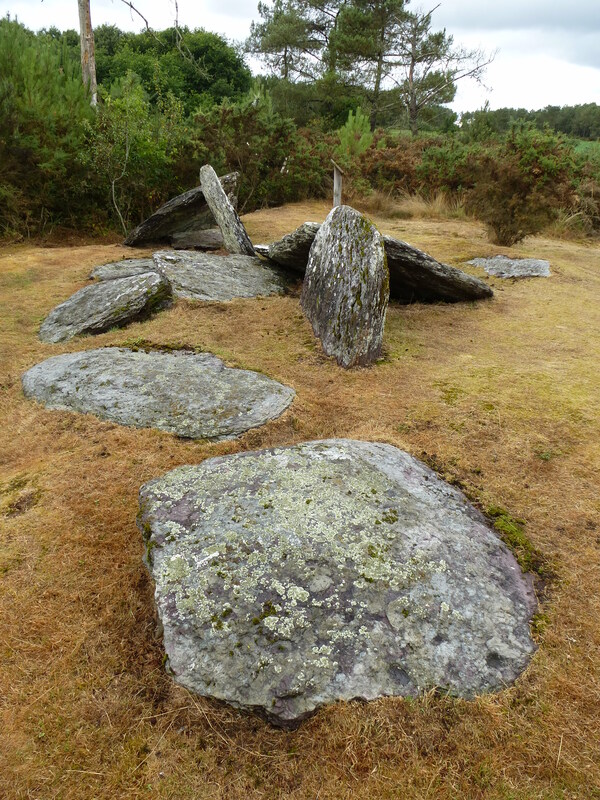 As this photo shows, the block is surrounded by a ring of smaller stones, making a rather unusual group which is probably the burial spot of a high-status individual. On the day that I visited it was also encircled by a mass of purple heather. As I carefully stepped across it, I noticed a low hum emanating from the ground below me. Looking down, I saw that the heather was alive with hordes of buzzing bees, hard at work collecting pollen from the bright blossom. It was just a short walk to the last site on my list. 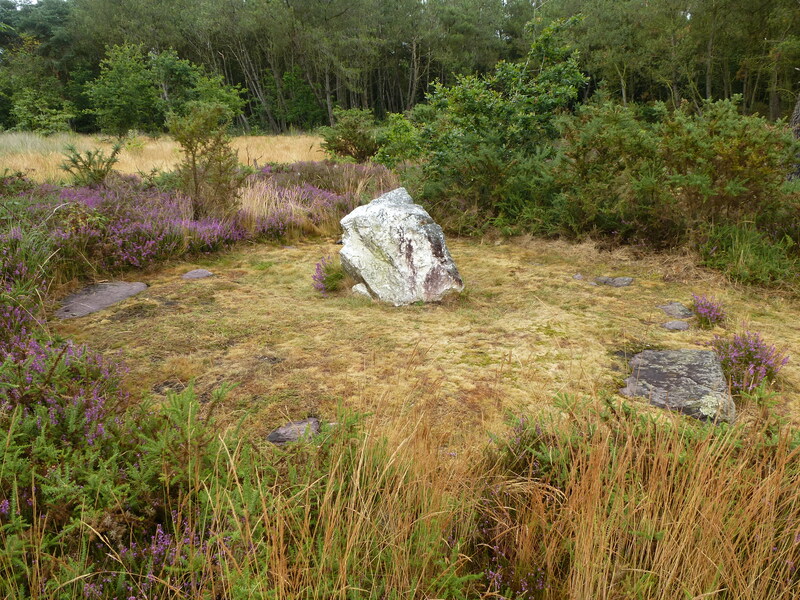 Also standing on the moors of Montneuf, although rather hidden by bushes and scrub, La Pièce Couverte is another passage grave which has lost its covering mound, its mighty stones now exposed to the open air. It may not be as imposing as La Loge Morinais, but La Pièce Couverte is notable for the ‘cup marks’ that decorate a number of its stones. Although quite hard to spot at first, once you see them these man-made hollows in the surface of the rock emerge all over the monument, an intriguing remnant filled with long-forgotten meaning. The final stretch of my walk took me across more open countryside, past a lake and through a pretty farmyard busy with clucking chickens. Soon I was back at the main stone circle of Montneuf, with its crowds of tourists, cropped lawns and carefully tended paths. The magic I had found up on the moors and deep in the forest was gone, but the memory of it will surely stay with me for a long time to come.